So far we have only built single triangles. Sometimes (such as in the last lesson) we have gotten advanced and drawn two triangles, but they were not connected. 3D models are made out of many triangles connected together to form geometry. In this lesson, we will cover how to build some simple geometry out of triangles, and how to move them, rotate them and size them as a whole. Quad, as we should all know, means four. In geometry, a quad is a four-sided shape of any kind. The following are each quads. Earlier I said that triangles make up all shapes in a 3D world. If you look carefully, each of these quads is made up of two triangles placed side by side. As a matter of fact, this is true of all quads, regardless of shape. 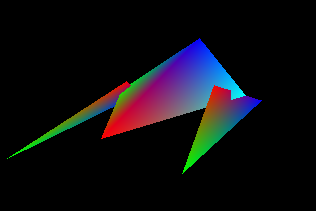 These two triangles combined can make quite a variety of useful shapes in game programming, such as building terrain, walls, boxes, and any other shape with four sides. The prime question is, how do you make them? We are already familiar with building triangles, so now let's look at how that code could be changed to draw a square instead. First, let's look at the init_graphics() function we were using earlier. This time, it has been changed to represent a quad, rather than a triangle. Notice there are four points here. The changes, as usual, are in bold. Now we have a full square in memory. Now how do we show it? Let's take a look at the code that draws them from the render_frame() function. Of course, there is also code to set up the pipeline, but that isn't relevant here. What is relevant is what is different about the DrawPrimitive() function. Notice that the first parameter now says D3DPT_TRIANGLESTRIP rather than D3DPT_TRIANGLELIST. Also notice that the third parameter was changed to a 2. And that's all there is to building a quad! Now let's combine our quads to make a cube, our first 3D model! It doesn't really make sense to create four vertices for every quad. If we made a cube, it would end up using twenty-four vertices, while it would really only have eight vertex positions. It would truly be easier if we could create eight vertices, then combine them to make six quads. Well we can do this, and it does make creating simple models in code much easier. The solution is the index buffer. 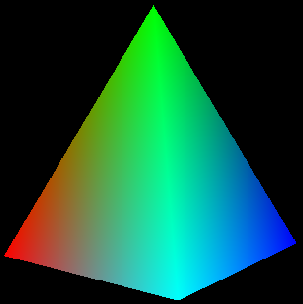 In DirectX, an index is an int storing the number of a vertex. They are given in order, so the first vertex in a buffer is vertex number 0, the second is vertex number 1, the third is 2, and so on. And index buffer is a buffer in memory that stores the order in which vertices should be rendered. Instead of storing a long list of coordinates, it instead stores a long list containing indexes (or indices). Here we have eight corners of a cube. Each corner has a coordinate in space, but is labeled with an index number. 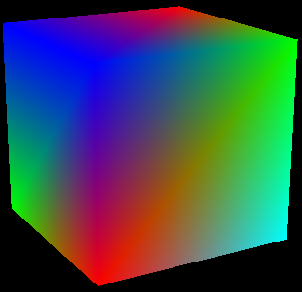 We make this by building a vertex buffer with eight different vertices, each representing one corner of the cube, including its coordinates and color. However, this doesn't create any triangles or quads, just corners. To build a triangle, we simply refer to three indices in a row. If we used "0, 1, 2" and "2, 1, 3", we would get these two triangles. Notice that we could do the same to each side of the cube, making one quad for each. Before we say which indices we want to use, we need to make an index buffer, so let's build one. We do this using a function called CreateIndexBuffer(). This is almost exactly the same as CreateVertexBuffer(). Only one parameter is different, but let's go ahead and look at them all briefly. This is the size of the buffer. Each index is stored in an int or a short. For compatibility reasons, we'll use short, so this will sizeof(short) multiplied by the number of indices you want to use. Just as before, we won't get into this parameter, but set it to 0. This parameter is new. Here we can put flags to tell DirectX how much space in memory we will give to each index. It can be D3DFMT_INDEX16 or D3DFMT_INDEX32. With 16, the indices will go to the video card twice as fast. However, you can only have up to 65536 indices. Occasionally you will need more than this. For our example, we will use D3DFMT_INDEX16, because not all video cards support 32-bits per index. This is the same as with the vertex buffer. It tells DirectX where to store this buffer. As before, we'll use D3DPOOL_MANAGED, meaning it will be located in video memory. This is the pointer to the index buffer we'll create. We put a blank pointer in, and CreateIndexBuffer() will fill it in for us so we can refer to it later. As with the vertex buffer, we'll set this to NULL. For the most part, this function appears the same. There are only a few, small differences. So how do we draw all this? It's pretty simple, but it needs some new functions. Here's the drawing code. This comes after all the transforms are set and before EndScene() is called. This is exactly the same as before. 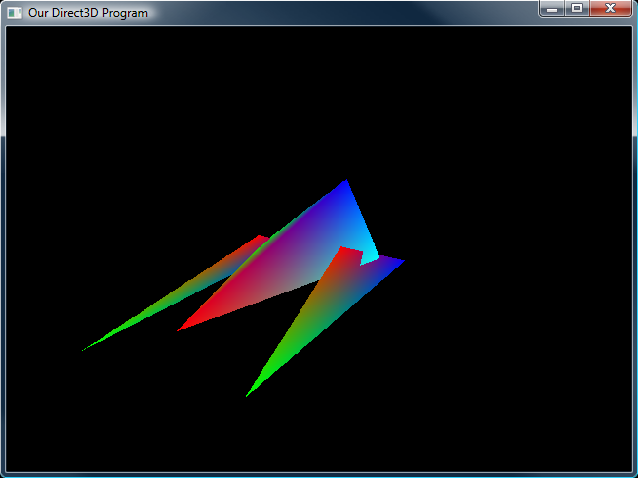 All it does is tell Direct3D which vertex buffer we are drawing from. This function is similar, but much simpler. It's purpose is to set the index buffer we will use. It has one parameter, the address of the index buffer. We only have one index buffer, so the parameter will be i_buffer. Remember that i_buffer is already a pointer, so we don't put &i_buffer. The first parameter is familiar to us. It's the style of drawing, such as triangle strips, or line lists. We're going to use D3DPT_TRIANGLELIST, because each set of three indices represents a whole triangle. The second parameter tells how many vertices into the buffer we want to start. We're going to put 0 here, but just so you get what this is, let's take a simple example. If we put 4 here, then index 0 would point to vertex 4, index 1 would point to vertex 5, and so on. The next number is the lowest index we'll use. We want 0, so we'll put 0. It's really just a hint to Direct3D on how to best optimize memory for us behind the scenes. The fourth parameter is the number of vertices we'll use. We use 8 in the cube. Again, this helps Direct3D with optimization. The fifth parameter tells DirectX where to start on the index buffer. This is used for more complicated situations where you have more than one shape stored in a single index buffer. For example, if we had a cube take up spaces 0 to 35, and a completely different shape take from 36 to 51, we could put 36 in this parameter, and DirectX would know where to start reading on the buffer. We aren't doing this, so we'll set it to 0, the beginning of the index buffer. The last parameter is the number of triangles we will draw. This cube draws twelve, two for each side. Try building the cube in your program and spinning it in various ways. Well, I don't know about you, but I'm really excited! We've built our first 3D object for real! 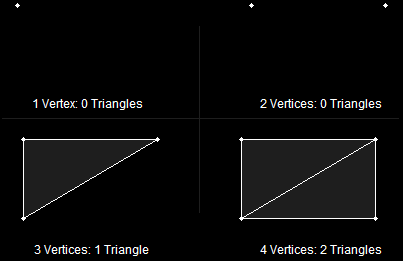 Let's look at a couple more simple models we can make using quads and triangles. Let's look at how to build this shape. Take a moment to study how this code differs from the cube's. And there you have it! We've got a functioning 3D model of a spaceship. Admittedly it could improve a little on the aerodynamics, but we'll get there for sure. For now, let's put in a rotation matrix and see what she looks like. I chose to use the Hypercraft model for this demo. It rotates around much like a car advertisement, only it looks somewhat more polygonal than an actual car. Now let's get on to lighting! Let's make these objects look cool!